Lobby Hero presented by 4th wall Theatre Company - Printer Friendly Page - On the Run - Theatre Port Houston - Theatre Auditions News and more! Lonergan’s mesmerizing ‘dramedy’ was nominated for a Drama Desk Award, Olivier Award, and Outer Critics Circle Award for best play. As the story unfolds and the tensions rise in the lobby of a Manhattan apartment building, we learn how Jeff—a hapless young security guard, his supervisor, an overbearing police officer and his young female partner are all drawn into a murder investigation. When Jeff’s tightly wound supervisor is called to bear witness against his troubled brother, and the attractive rookie cop finds she must stand up to her seasoned partner, loyalties are strained to the breaking point. Truth becomes elusive and justice proves costly. As the Spectator noted: “you can tell [Lobby Hero is] good because, within about five minutes, any sense you have of being a member of the audience, sitting down and watching a group of actors perform on stage, has vanished…. In what amounts to an out-of-body experience, you’re totally absorbed in what’s going on…Lonergan is particularly good, both here and in This Is Our Youth, at showing how good intentions can be undermined by unconscious desires.”. 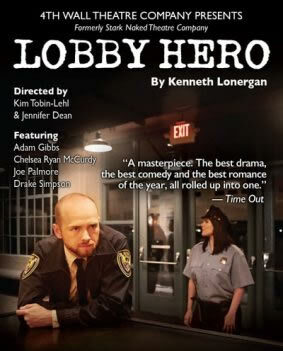 Previewing on May 11th, Lobby Hero opens on May 12th, and runs through Saturday, June 3rd, 2017. Performances will be held at 4th Wall’s STUDIO 101, located at Spring Street Studios, 1824 Spring Street, Houston, Texas, 77007. Regular show times are as follows: Thursdays, Fridays and Saturdays at 7:30 pm, Sundays at 3:00 pm, and a special “Pay What You Can” performance on Monday, May 29th at 7:30 pm.